In stock 54 pcs. Also available in our walk-in store. 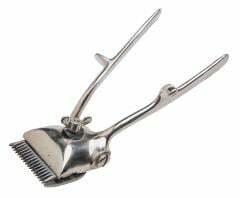 These used to be best gifts of industrial revolution - now you could do your home barbering without scissors! Works without electricity and comes with that communist touch of 'I don't care'. These are very handy if you are in need of cutting hair of rowdy children, military personnel or political prisoners. They might not have the luxury options of their Western counterparts like height adjustment, but they do cut hair and it takes will to do skin damage while barbering. 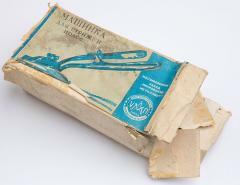 For that classic Soviet military almost-bald look, look no further. They have one big wing nut to separate the blades for cleaning. No other functionality except of course the hair cutting. These come in the remains of the original box, which has taken some storage damage. The cutters are steel and unused. 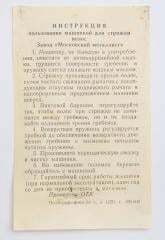 Most have a leaflet in some Soviet language describing the use, or perhaps listing reasons to inform your family members to the KGB. i´m very sad from my purchase of this product. it came with the mecanics covered in moscoline so i set about cleaning it up, but right after the central nut wich acts as the strong point broke. the nut looks made out of a different material than the rest of the hairclipper. i´ll try to stick it but i think welding it is the only option.